My Big Brother is Married! Jason and I made a trip to Portland for the week of my brother's wedding, which was July 18th. I got to stay with my friend Jenny McC. and see her and her new husband Derek's home for the first time. Jenny was a great hostess and we had lots of fun hanging out together the week leading up to the wedding. Joe and Michelle's wedding was beautiful. I was the "Best Amanda" for their wedding and was much relieved when my Rehearsal Dinner slide show and wedding reception toast were both a big hit. Well, before we left for California, we dropped the kitten off at the vet, and he got fixed up, and his foster parents- Heather and Chuck took care of him until we got home. Once we did get him back, we instantly fell in love. I can't stress enough to you how cute this kitten is. He is so cute that it is distracting. He is extremely frisky and unless he's napping, there is the constant sound of kitten tumble as he rolls across the floor and pounces on everything real and imagined. What did you name the little orange kitten? Well, the night we found him, we were with our friend Heather. The second we laid eyes on him, we wished we had not, because it was going to be a huge hassle to deal with this sick kitten. Jason suggested we named him "David Hasselhoff," and Heather agreed it was a good name. I really don't like the idea of naming pets people names, and I have a cousin in the family named David. But, I also didn't realize that at that moment, his name became official, because Jason was not open to changing it when I thought of a really awesome name for him-"Oats." So you can call him "David" or "the Hassel" or even "the Hoff." I like to call him by his full name "David Hasselhoff." He also goes by "The Kitten" and "Little Orange." What do Angel (the dog) and Tweed (our grey cat) think of the kitten? At first Angel would try and follow him around constantly and try and be a part of the play, and as I mentioned- he is frisky. Eventually this wears her out and she lays down. She also likes to lick him. The kitten is fearless and after one day of hiding under furniture, he does not flinch when Angel comes by for a kitty lick. At first Tweed made funny wine/growl noises, but never got a puffy tail. For the most part they are getting along very well. However, sometimes Tweed does get annoyed when she's ready for some quiet time, and the kitten keeps pouncing on her tail, or is being generally rambunctious. Luckily Tweed is such a sweet kitty. During their first few days together the kitten would actually charge Tweed. I am hoping that having the companionship will be good for Tweed, especially when we go out of town. So, he has definitely lived up to the name "the Hassel." It turned out that he gave Tweed his upper respiratory infection during their first encounter. This incubated while we were in California, and I noticed she was sick a day after we got back, so that meant an extra trip to the vet, 10 days of antibiotics for Tweed. Then, a few days later, we found out the kitten had a tapeworm! Another trip to the vet, more meds. So, we racked up a nice vet bill this month. But Little Orange already paid us back in full with cuteness. His kittenhood will be well photographed. After Jason and I spent a few days in San Francisco, we headed up to the Napa Valley for one day of wine tasting fun. Then down to Livermore, CA for Jared's wedding, the drove down the Pacific Coast Highway for the better part of 2 days until we got to L.A. Highlights from the trip included riding bikes from Fishman's Wharf across the Golden Gate Bridge into Sausalito to enjoy a late lunch/ early dinner right on the Bay, and back across on the Ferry. And the day driving around Napa tasting wine with Jason was also quite fun. 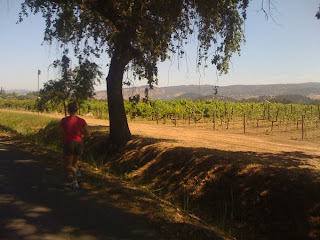 Running next to the grape fields in Napa- decided to run 3 on my 30th.